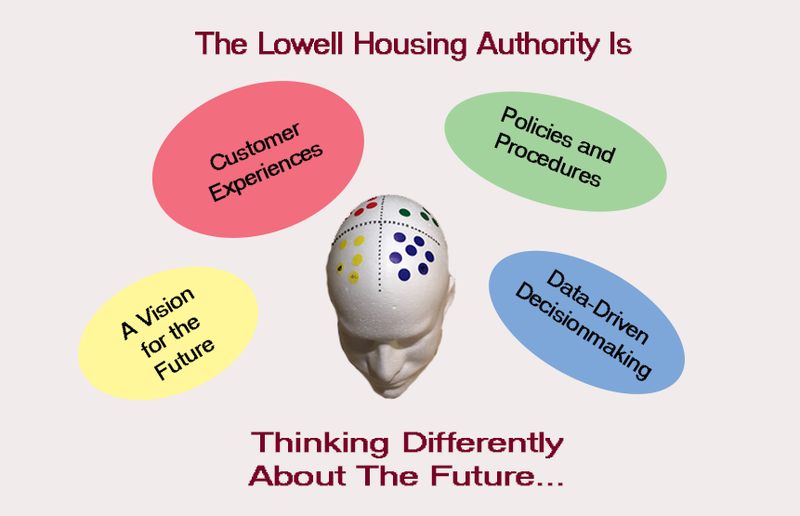 The LHA kicked off the agency’s next 5-Year planning process this month with a different approach to considering the future. In the spirit of embracing the values of the agency which focus on data driven decision-making and collaborative approaches to operational management, the LHA sought input from staff through a formal survey to evaluate important topics for future discussion. Select staff representing all departments of the agency will be attending a retreat entitled “Building Success,” which will help the agency formalize plans to keep the agency moving forward in evaluating programs and services and tackling the critical challenges of future. The retreat group met for the first time last Friday evening to “think differently” about the way our team thinks. The group was exposed to the theory of the Herrmann Brain, which helps to explain why people think differently, and evidence suggests helps build stronger, more productive working teams. Each staff member was asked to self-identify how they believe they think according to 4 colors and corresponding characteristics. While all staff make decisions based on all 4 colors at some point, the agency learned that each staff has a dominant color. This theoretical approach to planning was the perfect beginning to the full retreat to be held in February, which will ground future agency changes in evidence-based practices. Learn more about the Herrmann Brain here.